Are the ‘Sons of the Eagles’ Byzantine? Boris asks if the Albanian people have their roots in Byzantium. 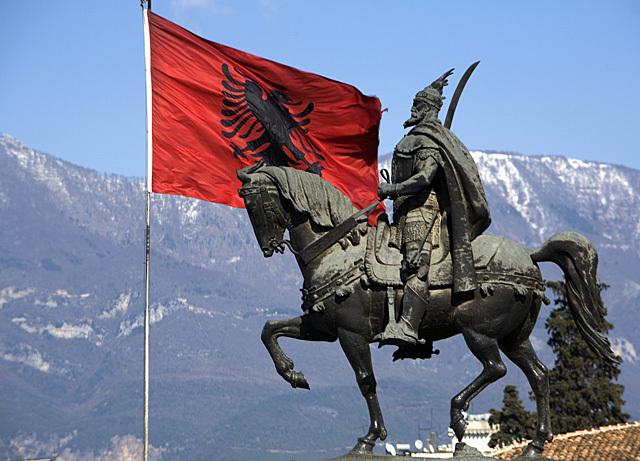 The Albanian flag prominently displays the Byzantine double-eagle and Albanians refer to themselves as “Shqiptaret” which means “Sons of the Eagles”. So at first blush it would seem natural to assume that the Albanians- like so many peoples in the Balkans- draw their cultural identity from Byzantium. But is it ever really that simple? There are hints that the Albanians are quite a bit older than they seem. They speak an Indo-European language that is based on an ancient Balkan tongue. Aside from Greek, it is the only modern survivor- though no one seems exactly sure which paleo-Balkan language it comes from. The problem is that Balkan history is notorious for its invasions. The Romans called the original inhabitants Illyrians, and they were joined by waves of Dacians, Thracians, Slavs, and Greeks among others. So who are the modern Albanians descended from? This is where politics enter the mix. The communist government after World War Two pushed the Illyrian connection to increase its prestige. Unfortunately for the communists there are some problems with this pedigree. The Roman writer Polybius claims there was a city called ‘Albonopolis’ in Illyria (hence the name ‘Albania’), but the original inhabitants were extinct by the time of Justinian. The first mention we have of ‘modern’ Albanians is in 1079 when a Byzantine author referred to certain ‘Albanoi’ who took part in a revolt. Anna Comnena mentions them rioting again during the early part of her father’s reign, and says that they were under the control of the nearby city of Dürres. Written Albanian doesn’t appear until 1462, and appears to be more influenced by eastern Romance languages than classical Latin- meaning that the earliest it could have come into the area is late antiquity. Of course as with any charged debate, there are plenty of dissenting voices. Some linguists believe modern Albanian has loanwords from the time of Augustus- 85 of which don’t appear in any other Romance language. The truth is that modern Albanians probably don’t have a single origin but are a mix of things- a microcosm of Balkan history itself. In a way their flag is a perfect symbol. Its Byzantine imagery hints at a deep Orthodox history but it’s really a glorification of something else entirely. In 1443 the national hero Skanderbeg adopted it as his coat of arms and briefly managed to throw off the Ottoman yoke. When the modern nation repeated the feat permanently in 1912, they could think of no finer symbol for their freedom.